Nancy and Donald Roan, Lest I Shall Be Forgotten: Anecdotes and Traditions of Quilts (Green Lane, PA: Goschenhoppen Historians, Inc., 1993). Suellen Meyer, "Characteristics of Missouri-German Quilts,” Uncoverings 5 (1984): 99-114. Fawn Valentine, “Aesthetics and Ethnicity: Scotch-Irish Quilts in West Virginia,” Uncoverings 15 (1994): 7-44. Cuesta Benberry, Always There: The African-American Presence in American Quilts (Louisville, Kentucky: The Kentucky Quilt Project, 1992). Susan Salser, American Quilts Empowered Immigrant Women (The Quilt Index, 2011). The population of the United States is composed of people of countless different races and ethnicities. 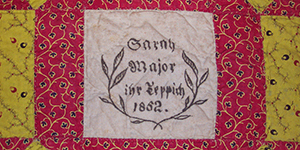 Some of these groups have been especially known for making quilts; others seem not to have made them at all. Think about your own family: which of your ancestors, if any, made quilts? Was quiltmaking a big part of their lives? Did they make quilts with members of their same ethnic community? Members of some ethnic groups have been avid quiltmakers and developed stylistic hallmarks. For instance, generally speaking, 19th-century Pennsylvania Germans gravitated towards bold color combinations in pieced block format while their neighbors of English descent tended to make more finely worked quilts—like template-pieced mosaics—in more muted colors. But even with ethnic groups famous for certain styles, we must exercise caution when identifying their quilts. For instance, making an “Amish-style” quilt was all the rage in the 1980s and “improvisational” quilts have sometimes been assumed to be African American, even without any documentation. Because America is a “melting pot” or “salad bowl” society, many quiltmakers from specific ethnic groups, even early on, had contact with other groups—they were neighbors, they did business together, and they possibly even sat next to each other in church. They also likely exchanged ideas and patterns for quilts. Some ethnic groups came to the United States without a well-developed quilt tradition of their own but quickly latched onto it, wanting to become “more American” themselves. Norwegian immigrants, for instance, who largely brought woven coverlets with them, began making quilts almost immediately upon arrival in the United States. And as quilts rapidly became big business, anyone in America could purchase the same Ladies Art Company pattern, Marie Webster kit, or Mountain Mist batting with patterns printed on the package. All of this meant that ethnicity became even less distinguishable in the landscape of American quilts as time went on. Read more about Distinct Traditions?